Rumi, like all true masters of the art of self-realization, was totally original. Years ago I was in touch with a well-produced cultural magazine in Saudi Arabia. But as soon as they heard that I’d like to submit articles on Rumi, they said they couldn’t mention Rumi in Saudi Arabia at all because he is considered blasphemous and his poetry is not allowed there. Rumi, like all true masters of the art of self-realization, was totally original. He was insanely gifted both creatively and mystically in addition he was wealthy, socially and culturally influential, had massive political power and was the most famous personality in the region during his lifetime and beyond. It’s impossible today to imagine how popular poetry was at that time. It was the pop music of its time. The only massively popular art form really. Since local singers would put to music the verses of popular poets, their poems where both recited and sung. History remembers tyrants, prophets and poets. Tyrants were kings/rulers with distinct bloodlines or bloodthirsty military types who took lands by force. And the world only has a handful of popular prophets. So those two positions were near impossible to attain for highly gifted and charismatic individuals like Rumi. But to become a grandmaster poet, if you had the poetic chops, was a wide-open field. Historically speaking almost all creative types had to cater to a patron to survive and to be allowed to work and display their art. Be it the Vatican, the Medici family or various major landowners, the nobility and courts of kings. And with patronage always comes censorship, because ultimately you are producing and altering your work for the patron’s approval. Rumi was the complete exception. The sultan of the region at the time, part of the Kayqubad dynasty, was one of his students. So in essence Rumi was above the king, hence above the military and certainly above the big mosque and all the clerics. This, in addition to his own independent lifestyle, gave him enormous power to express himself without any reservation. He also became the head of his tribe at the age of 24, upon the passing of his father, so he didn’t even had to submit to a paternal authority like most young men of his time. Rumi was totally his own man. An utterly brilliant artist and a true genius who after the death of his mentor Shams became unstoppable. Although historically (and still today) in Middle East the clerics (or mullahs) would immediately execute blasphemous people however no cleric dared to censor Rumi’s work. So the result is not just one or two lines but hundreds of Rumi poems that are openly anti-religion and pro self-empowerment. 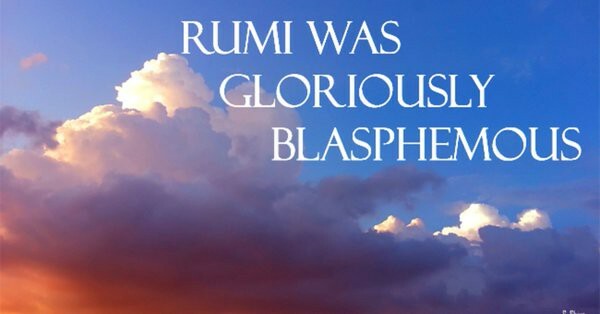 I have several examples of Rumi’s “blasphemous” poems on my Rumi Network website in the Rumi Poetry section. Two such poems are below. (1) I have lost myself in God, and now God is mine. Don’t look for Him in every direction, for He is in my soul. I am the Sultan. I would be lying. If I said that there is someone who is my sultan. (2) This is you, making me drunk in a monastery. Turning me into an idol worshiper while I am seated at Kaaba. I have no control in this game of good and bad. Almost all his anti-religion poetry are from his first collection titled Divan-e Shams-e Tabrizi, which has been my subject of study from day one. Rumi’s brilliant mind mixed with his independent lifestyle gave him a unique sense of expression that is very rare in Mideast and is badly needed in today’s highly oppressive environment. Whose Rumi is He Anyway?